If nothing else, XCOM: Enemy Within is the game that allowed me to chop Charles Dickens' arms and legs off. This may seem grisly for a plus point, but when you too have been required to read Bleak House and David Copperfield back to back within the space of a fortnight for the sake of a degree, you'll understand why this was so cathartic. Of course, Mr Dickens wasn't left lying on the floor like some kind of meat carpet. There was a method behind this madness, and soon a set of flashy robotic limbs had been grafted onto those writerly stumps, limbs designed not for crafting witty characters or writing incisive social commentary, but to interface with a seven-foot mechanised suit of armour. 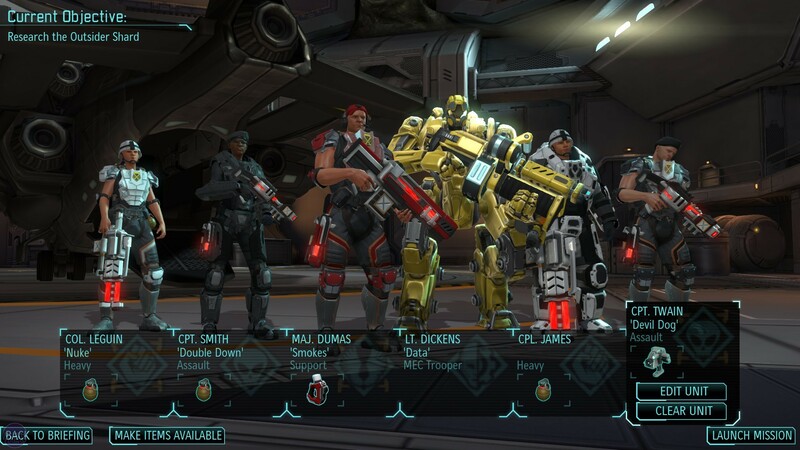 You see, XCOM: Enemy Unknown lets you name your soldiers after your favourite thing, be it famous authors, musicians, or your best friends. You then laugh as they are given amusingly randomised nicknames by the computer and send them out to save the world from aliens. Or at least, attempt to save it and be mercilessly torn to shreds by a far superior adversary in the process. Enemy Within takes this one step further, allowing you to mess with your soldier’s bodies as well as their identities. This is why Lieutenant Charles 'Data' Dickens is encased in a hulking metal death-frame, called the MEC, equipped with minigun and flamethrower, why Captain Virginia 'Longbow' Woolf is a hotshot Sniper able to turn invisible and leap onto a two-storey building in a single bound, and why Sergeant Mark 'Devil Dog' Twain is a ferocious Assault solider whose adrenal glands have been genetically altered to release adrenaline clouds from his skin, boosting the combat effectiveness of nearby squadmates. 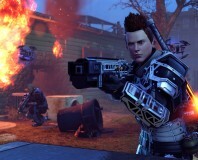 How Enemy Within alters your soldiers is broadly speaking how it changes XCOM as a whole. It takes the base experience and augments it into something better, more novel and more substantial. It adds new abilities, new equipment, new threats, new maps and new missions. There are downsides: financial management is now much more complicated, and the expansion is rather bottom-heavy, but like the genetic alterations to your soldiers, these are definitely sacrifices worth making. 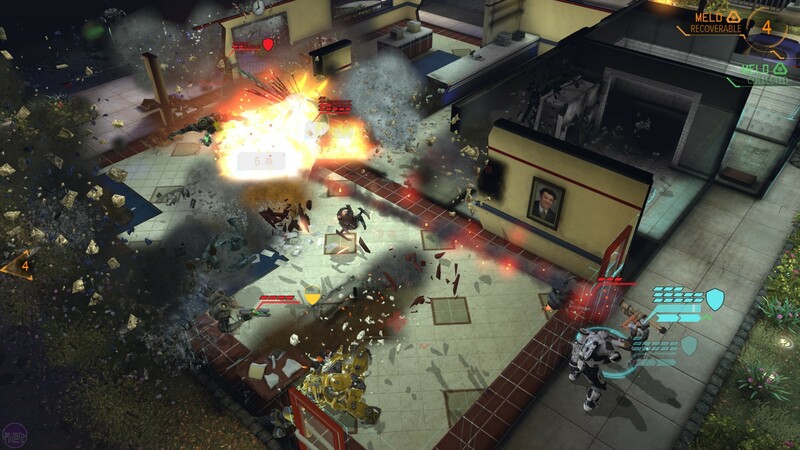 As an expansion Enemy Unknown is dissipated through the familiar XCOM campaign, as opposed to adding a single, separate chunk of game somewhere down the line. This means you're playing through the same story a second time. 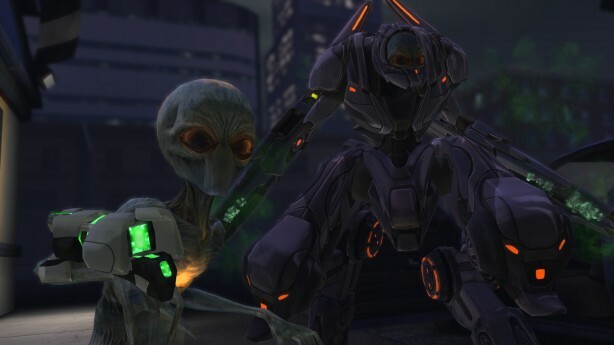 Fortunately, Enemy Unknown is entirely geared toward making you want to do that, and it doesn't hesitate in letting you play with its new toys. A new tutorial mission immediately introduces you to MELD. No, that isn't the rejected sixth member of the Spice Girls, but a new currency used to genetically and cybernetically enhance your soldiers. MELD is contained in two canisters located somewhere on each Terror map, which must be retrieved within a certain number of turns before it self-destructs. The idea behind this is to add a new tactical element into the game. The perishable nature and often inconvenient location of MELD is intended to coax you out of a close-knit formation and risk isolating your soldiers to acquire this precious material. In that regard it works, although the approach is a little ham-fisted. The spinning yellow MELD canisters are completely incongruous with the map designs, and the appearance of precisely two on every map feels arbitrary. It's the only aspect of the update that feels stapled on instead of neatly woven in. 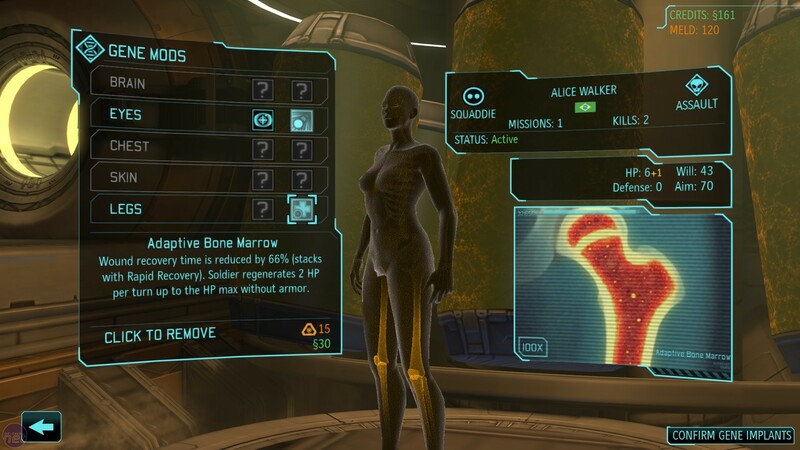 Anyway, once you've grabbed a handful of MELD and built the appropriate facilities, you can send your troops either to the Gene lab for enhancement surgery, or to the MEC department for cybernetic limb replacement. The influx of MELD is strangely handled. Early in the game it's fairly abundant, but because most genetic abilities are discovered through alien autopsies, there isn't an awful lot to spend it on. But you do anyway, because you want to experiment, and giving all your soldiers leg-bones that regenerate health seems like a sensible thing to do. Trouble is, the more advanced abilities and MEC upgrades cost quite a lot of MELD, which is less readily available in the mid-game because the variety of missions increases considerably.